There is absolutely no doubt by now that ongoing repressions of gay men, as well as men suspected in homosexuality, in the Chechen Republic of the Russian Federation have a character of structural violence. According to media reports, hundreds of men were detained by local law enforcement agencies and subjected to violence and torture, and at least three of them were reportedly killed. The region-wide hunt against gay men is supported by the society, including gay men’s families, and religious leaders. Media and journalists are being intimidated after their publications about situation of human rights in Chechnya. As shocking as they are, these developments are not surprising. 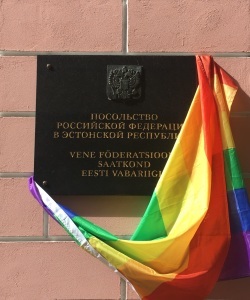 In the last decade, homophobic policies of Russian authorities have led to the introduction of a ‘gay propaganda’ law inside the country and increasing promotion of the same discriminatory approaches at international level. The message is clear: Russian authorities do not consider their LGBT citizens equal with other people. Local authorities of Chechnya are vehemently denying the ongoing terror against its citizens and Russian federal authorities ignore demands to investigate cases of violence, torture and murder of people on the grounds of sexual orientation. The developments in Chechnya can have far reaching consequences outside of its border. 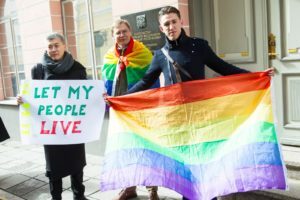 They serve as a message to those in Russia and in the rest of Eastern Europe and Central Asia who have the courage to openly live their lives, that they should go back to the closet – and that those who could not come out yet, mustn’t even think about it. In the end, these violent repressions are not intended to kill specific people for specific or intended cases but to threaten and terrorize hundreds of thousands in Chechnya and elsewhere. Human rights violations, violence, and being forced to hide will undoubtedly contribute to the growing rates of the HIV epidemic among gay men and other MSM in Russia. At the moment, NGOs continue collecting information from people who need help in leaving Chechnya or getting support while having left the territory of Chechnya. The Russian LGBT Network which helps Chechen gay men in danger, registered 75 requests from for help; 35 people were assisted in emergency evacuation from the Chechen Republic. Eurasian Coalition on Male Health (ECOM) calls not to stay away and to take steps to change the situation in Chechnya. Each of us can help save the lives of dozens of people who are being hunted. ECOM reconfirms it is ready to provide any assistance possible to the frontline defenders in the Russian LGBT Network. ECOM joins the calls of the Russian LGBT Network to the UN bodies and other international organizations not to ignore the facts of violence against homosexuals in Chechnya and to insist on investigating the cases of violence and torture against homosexuals in Chechnya. We also call on the UN bodies to ensure protection for journalists who had courage to shed the light. 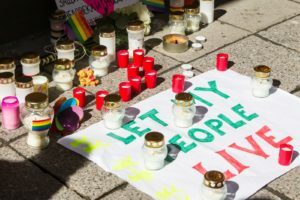 ECOM calls on the authorities and societies of the European Union countries and Canada to provide accelerated asylum for gay refugees from Chechnya. Their number is small but their lives are in danger as long as they continue to be on the Russian territory. Although it has been more than twenty days since we learned about what is going on in Chechnya, we should keep it high on radar. Keep talking about the situation in Chechnya and share the information in your networks. organize protest actions in front of the Russian Embassies in your countries and talk about the problem at any international events in which Russian official delegations take part. It is difficult to get information from the ground. If you have it, please pass it on to the Russian LGBT Network or us. And last but not the least, do not give up! This was the intention of those who started the mass terror. Be stronger!